Create Embellish Adore: Party hearty!!! Wow, sorry for the neglect... it was a crazy end of week, last week. We unexpectedly left to help a fellow soldier out with some home repairs in North Carolina. Since upon his return from yet another OIF tour, he is left with a few medical conditions that are serious. So we played road warrior and jumped in to help where needed. The family was delighted with the outcome of new railing on their back deck & ramp, then adding the accent lights.. it was like Ty Pennington made a visit. We learned a birthday was to be had for one of the family members, while were there so after getting my overnight bag packed, I put together a quick card to give to him. I mean, real quick like the ink took longer to dry because it was that quick! I used Everthing Nice with the retired Tropical Oasis DSP paper. I used the small oval punch for the balloons (colors in the DSP) and a silver pen to make the strings. 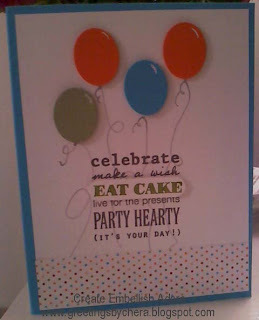 I popped out the balloons and the EAT CAKE sentiment in another color. Thank a soldier when you can!